Well, we’ve survived the first presidential debate between Hillary Clinton and Donald Trump, and it was a doozy. It wasn’t, however, a close call: Clinton dominated Trump from beginning to end, knocking him off of his game several times and effectively depicting him as a bumbling, unprepared, impulsive buffoon. Clinton most definitely won on Monday night — but there were several more debate winners and losers as well. In many cases, it’s hard to say who “won” a debate. Nobody is giving out points or trophies to the candidates, because in actuality, there is no official “winner” of a debate. The thing we call a debate is actually just two people standing on a stage talking; the real “winner” of the presidential debates, of course, is the person who goes on to win the election in November. Although Clinton’s victory was clear-cut, that ultimately won’t mean anything if she doesn’t win the election. Likewise, Trump’s walloping on Monday will be quickly forgotten if he becomes the next president of the United States. So, for the time being, let’s instead focus on some of the slightly less obvious winners and losers of the night. Because there sure as hell were a few of them. During a circuitous and long-winded attempt to explain away his birtherism, Trump repeatedly claimed that “nobody calls Sean Hannity,” the idea being that Hannity could have confirmed that Trump wasn’t really a birther, or something like that. In doing so, though, Trump gave the impression that Hannity just isn’t a very popular guy, and that nobody calls him up to hang out. Sad! Before this debate, there was an extensive meta-debate over whether or not the moderators — in this case, NBC’s Lester Holt — should fact-check candidates in real-time or simply let them go at it. The pro-fact-checking contingent won out: Holt assertively called out the candidates (mostly Trump) on their lies, and didn’t let them get away with misrepresenting themselves. Everyone who works in political journalism does a bit of fact-checking here and there, but only a select few were tasked with actually fact-checking the entire debate. This was nothing less than an exhausting, gargantuan, soul-draining undertaking. To those who performed this valuable service: I salute you, and I’m sorry that your Monday night sucked. Believe it or not, the peso surged in value during the debate. It had plummeted in value earlier in the campaign, and there was widespread belief amongst traders and analysts that this drop was due to fears that Trump would win the presidency. As Clinton swept the floor with Trump at the debate, the peso recovered. Go peso! 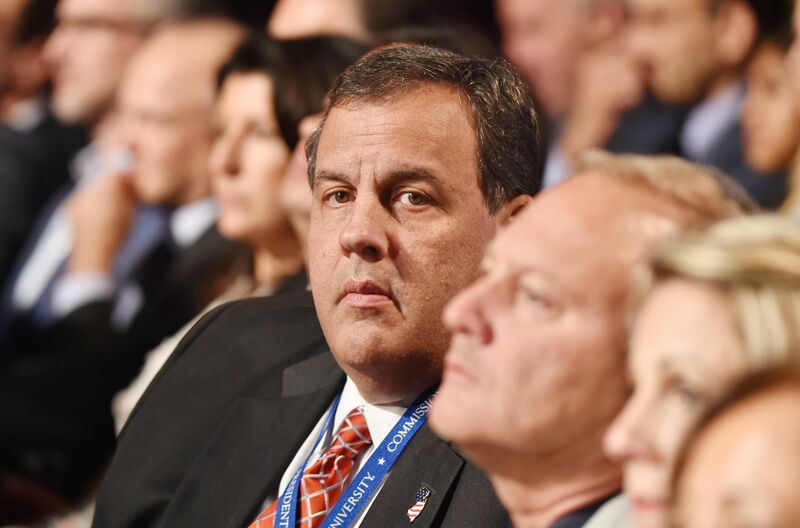 Trump bootlicker Chris Christie, also the governor of New Jersey, was brought into the spin room after the debate to try and present Trump’s performance as a victory. At least, that’s what he was supposed to do. In actuality, Christie admitted that “there’s always room for improvement” and accused fact-checkers of having “an agenda” (otherwise known as “the truth”). He didn’t provide much of a defense, and appeared depressed while doing it, perhaps having realized that hitching his caboose to the Trump Train wasn’t a wise political decision. This was an utterly surreal presidential debate, and bars and restaurants across the country were ready. There were debate watch parties across the country, and considering the gravity of this particular election, it’s safe to say that a lot of people were getting very, very drunk as the two candidates duked it out. That’s bad news for the country, but great news for the bartenders and servers who had to work Monday night. Trump was sniffling throughout the debate, and it didn’t go unnoticed. It’s unclear if this was due to some sort of undisclosed illness, the climate in the room, or perhaps just Trump being a 70-year-old man. But he certainly had the sniffles on Monday night. Here’s hoping his nose enjoys a full recovery.